Get the details on this promo for CND Vinylux at Rite Aid! If you do your own nails at home, you'll want to try this Essie Gel Setter Top Coat for a long-lasting color, high shine and gel-like finish. 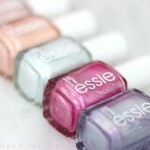 Take a closer look at the newest essie summer release: The Seaglass Shimmers collection! See swatches of all six beachy shades. Learn the secret to my favorite nail looks-- KISS imPRESS Press On Manicures! These never fail to deliver when I want chic nails quickly. The Essie Gel Couture polish needs no lamp, but can last up to 14 days?!? Here's how long it really lasted on me. 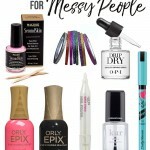 Too messy for at-home manicures? Check out these seven must-have manicure products that will give you the help you need to take your nail game to the next level. 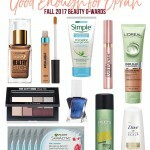 I recently discovered a slew of new beauty products from up-and-coming brands that are blowing my mind. Check out what's new on the scene. 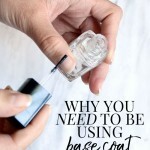 Find out why you should wear a base coat-- it's a step you shouldn't skip in any manicure! See my favorites to pick up and add to your routine. 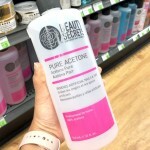 Does the CVS brand Beauty 460 No-Light Gel Polish actually last up to 10 days? See a before and after in this review of the base coat, top coat, and color.